This is Freiwald observatory in Upper Austria. 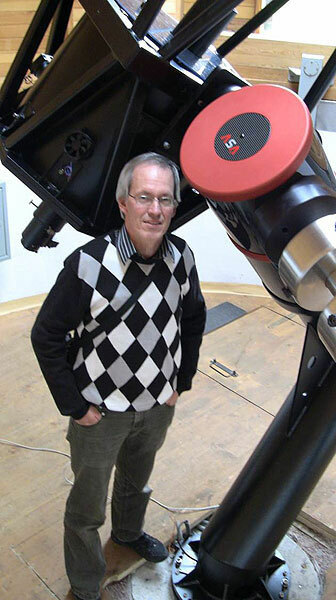 The instrument is a 60 centimeter Cassegrain which is practically identical to the instrument in Norway, both the truss tube (background) and the mount (foreground). I 2010, I visited the production hall of Astrosysteme Austria (ASA) in Freistadt, Austria. I was also present during the installation and testing of the fabulous ASA DDM 160 direct-drive mount. I happily received my first telescope when I was six years old. It was a very small newtonian with an eight centimeter primary mirror. As the years passed, my telescopes became larger and better quality. When I was nineteen, I worked part-time at the SFA university observatory in Texas. The main instrument was a 46 centimeter (18 inch) Cassegrain telescope. NASA used this instrument in the early 1960's for infrared mapping of dust on the moon. The result of these studies were used to determine suitable landing sites for the Apollo landers.